"I welcome the appearance in print of the Reader, and especially of those selections previously inaccessible to English-language readers. It serves the demand of the modern age for capsule form, yet preserves the integrity of the texts." - Aleksandr Solzhenitsyn (1918-2008) "A fine antidote to such simple-minded pigeonholing of Solzhenitsyn - as the brave anti-communist who later went off the deep end - is, as the author suggested, to read his work, particularly his later writings, which are not remotely as one-note as shibboleths about him suggest...[c]ompiled with the cooperation of both Solzhenitsyn and his three sons, it provides a far more textured picture of the writer as an unrelenting artist...a flexible and theologically minded philosopher;...an often daring stylist; and a political and nationalist 'ideologue' only in the eyes of predisposed critics." 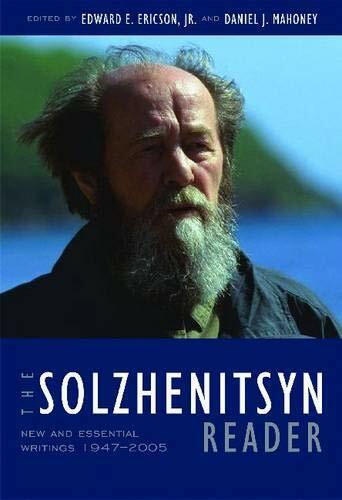 - Philadelphia Inquirer "[A] superb volume with a terrific introduction that places Solzhenitsyn's life and thought in clear context." - John Barron, Chicago Sun-Times"
The Russian writer and Nobel laureate Aleksandr Solzhenitsyn was one of the truly monumental figures of our time. After spending time in the Soviet gulag and pursuing the life of an underground writer, he was catapulted to international fame with the unexpected publication of "One Day in the Life of Ivan Denisovich in 1962". His unyielding and courageous opposition to the twentieth century's most powerful totalitarian regime eventually led to his exile to the West in 1974, where he spent 20 years before returning to his native Russia in 1994. This reader, compiled by the distinguished Solzhenitsyn scholars Edward E. Ericson, Jr., and Daniel J. Mahoney with the cooperation of the Solzhenitsyn family, provides in one volume a rich and representative selection of Solzhenitsyn's voluminous works. Reproduced in their entirety are early poems, early and late short stories, early and late 'miniatures' (or prose poems), and many of Solzhenitsyn's famous - and not-so-famous - essays and speeches. The volume also includes excerpts from Solzhenitsyn's great novels, memoirs, books of political analysis and historical scholarship, and the literary and historical masterpieces The Gulag Archipelago and The Red Wheel. More than one quarter of the material has never before appeared in English.